Aside from the time I almost broke my tooth on a piece of plastic that was stuck inside of a Maraschino cherry (and was only compensated with a $10 gift certificate that I basically had to beg for), Mom and I really enjoy visiting Newport Creamery. The original location in Newport, RI, will always hold a special place in our hearts, but we often visit our own hometown location on President Avenue here in Fall River. We are never disappointed (I should mention that the cherry incident happened in Newport). On today's visit, at around 3:30 p.m., we had one thing in mind - ice cream. 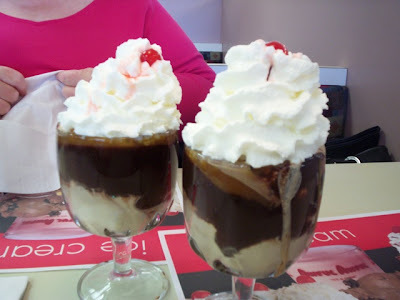 Since we never did get that milkshake at Red Robin, Mom and I were all about getting a big sundae with lots of toppings and the delicious Newport Creamery ice cream. We pulled into the parking lot and luckily got a space close to the door (the lot, although located in a large plaza, fills up fast). Mom and I stepped inside and read the sign that told us to wait to be seated by a member of the waitstaff. We didn't wait long before a waitress with a blue Newport Creamery shirt came over, grabbed a few plastic-covered menus, and escorted us to a booth that was just across from the grill. After she left, we were joined by a second waitress named Kayla. Mom said that Kayla must be new to waitressing because she was very pleasant. Perhaps if we catch her in a few months, it will be a different story. We hope not! She offered to bring Mom and I two waters and we gladly accepted. They quickly arrived in plastic glasses. Kayla also asked us if we would be having ice cream. We said yes, and she took away the silverware that was left on the table for us. After asking for a few moments to decide, Kayla returned to find that both Mom and I were getting the exact same thing - a Turtle Sundae made with three scoops of coffee ice cream ($5.09 each). This particular sundae is topped with hot fudge, caramel, walnuts, whipped cream, and a cherry. Kayla happily took our order to the open kitchen area, which is just part of the Newport Creamery charm. I always feel at home inside Newport Creamery. No matter which location you visit (either the two in Massachusetts or the 11 in Rhode Island), all of them look pretty much the same. Obviously, this happens with chain restaurants, but there's something cozy about this place. 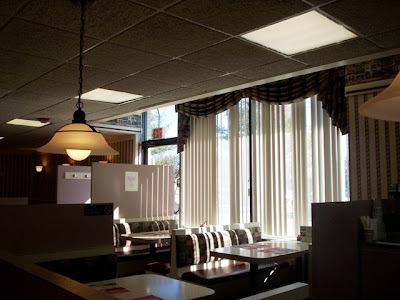 Perhaps it is the beige booths, tables, and dividers (there are are only booths and a counter at the Fall River location), or the striped wallpaper and colorful paper place mats with pictures of delicious food on them. Whatever it may be, I like Newport Creamery a lot better than I like Friendly's. 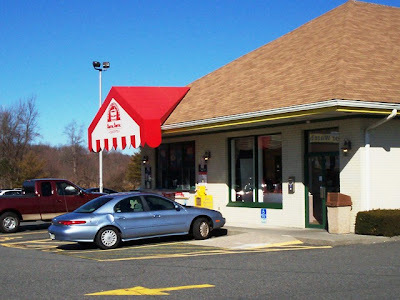 Friendly's, to me, is always frantic, while Newport Creamery seems to attract a calmer crowd. There are hanging lights above each booth, and large windows all around the restaurant which are shaded by Venetian blinds when the sun's rays get a little overwhelming. Located next to the open kitchen are two coolers - one for ice cream cakes, and the other for tubs of Newport Creamery ice cream that are for sale. This area is also where you can walk in and order something to go, and on summer days, the outside window is open for ice cream and other cool treats. Newport Creamery has it all. From breakfast to dessert, you can pretty much get anything your heart desires here, and the service is usually very good. Both Mom and I really enjoy their breakfasts, but we usually get a late start during the day and are too late to order it. We really wish the breakfast menu could be served past noon. What we really adore are the hash browns. Mom says that they resemble a little square fry more than the fried potatoes that people are used to - so delicious. Mom calls them "puffs of delight," and that's exactly what they are! I really enjoy their omelets and stuffed French toast. For people who are coming in for lunch or dinner, the options are almost endless. Starters include items like the Newport French fries ($2.59), popcorn chicken basket ($5.99), cheese quesadilla ($6.19), and buffalo chicken tenders ($6.99). You can also order soup, including Newport's famous clam chowder (cup - $2.69; bowl - $3.69; bread boule - $4.69). Sandwiches include the Newport clubs ($7.19) featuring the Big Beef cheeseburger, tuna salad, chicken salad, ham and turkey, deli sandwiches ($6.49), and Mega Melts ($7.19), which features ham and cheese, tuna and cheddar, or turkey and Swiss served with tomato on grilled New York deli rye. All sandwiches are served with your choice of fries, seasoned fries, potato salad, cole slaw, broccoli, vegetable medley, or mashed potatoes with gravy. Salads include the Executive Chef's salad ($6.89), the sesame pineapple chicken salad ($7.19), and the salad and half chicken quesadilla ($6.09). Newport Creamery has a variety of chicken sandwiches including the BBQ and cheddar ($7.39), and a steak and seafood menu that includes steak sandwiches ($6.39) and a New Englander fish sandwich ($5.99). I always hear good things about the burgers here, and it's probably because Newport Creamery uses 100% fresh Black Angus beef. Burgers range from the Big Beef ($5.69) to the Smoky Mountain BBQ Superburger ($7.79), which is a half pound burger topped with cheddar cheese, bacon, onions, and BBQ sauce, served on a bulkie roll with lettuce and tomatoes. If that doesn't satisfy your craving for meat, perhaps you can try to take on the Holy Cow burger ($8.69), featuring a whole pound of beef served club style (probably because it's easier to get it in your mouth). Newport Creamery also has a list of comfort foods such as their chicken pot pie ($6.99 - but it's seasonal), fried clam dinner ($7.29), and the fresh battered fish and chips dinner ($7.59). However, some people have never even eaten a meal here! They just come for their award-winning ice cream. You can get anything from an ice cream soda ($3.49), to their famous Awful Awful ($3.59 and up). The motto is that it's "awful big, awful good," and they're right. However, my mother thinks that it is weird that, to make an Awful Awful, you have to start with a vanilla base. Why would you when you have all the flavors right in front of you? I tried to explain that a frappe is made with flavored ice cream, but I understand what she means. She's just looking for more flavor in her drink, and who doesn't want that? Other ice cream treats include the clown sundae ($2.49), the Super Chipper ($2.79) which is a giant ice cream sandwich on a cookie, and their large list of gourmet sundaes. You can even be brave and order the Holy Cow sundae ($9.99), that is, if you're willing to eat ten scoops of ice cream, four toppings, banana wheels, and walnuts. It did not take long for our ice cream to arrive. Both sundaes looked amazing, although mine seemed to be leaking. Mom was in heaven because she was eating her favorite treat - coffee ice cream. What she enjoys about the sundaes from Newport Creamery is the fact that the ice cream is always nice and firm. She doesn't like when the toppings overwhelm the ice cream, making it mushy. The whipped cream topping was real and delicious. Mom's only gripe was, although the toppings were fresh, they could have been a little warmer. Perhaps they would have jelled with the ice cream more instead of clumping at the bottom of her glass, making it look like there were more toppings than ice cream. Either way, she thoroughly enjoyed her sundae, and said that it is a great size for the price. I feel the same way about the toppings. I even think that maybe they went a little too heavy with them as I couldn't even get my spoon into the ice cream without some liquid pouring down the side of my glass. By the time I had finished, I had accumulated a small puddle of goo on my paper place mat. Although the sundae was delicious, this is not the first time that I've had a messy experience with one. Nevertheless, I stuffed my face until I couldn't even move. I love ice cream. Mom left $13 in the bill holder for Kayla, which included 20% tip, as we slowly made our way toward the front door. As we got into my car, we both commented on how much we like Newport Creamery. It may not be everyone's first choice for breakfast, lunch, or a sundae, but it has always been a part of my family's eating history, and I can't wait to go back again. I'm just sorry that they removed the Swansea Mall and Silver City Galleria locations. I know how popular they were. Perhaps they could make a return? The Newport Creamery in Fall River is located at 1670 President Avenue. The hours are 7 a.m. to 10 p.m. Sunday through Thursday, and 7 a.m. to 11 p.m. Friday and Saturday. Breakfast is served until 11 a.m. on weekdays, 11:30 a.m. on Saturday, and 12 p.m. on Sunday. For more information, call (508) 678-6346.